18ct White Gold Diamond Set and Brushed Finish Wedding Ring — Form Bespoke Jewellers Ltd. This beautiful brushed finish wedding ring boasts a selection of round brilliant cut diamonds of varying sizes. 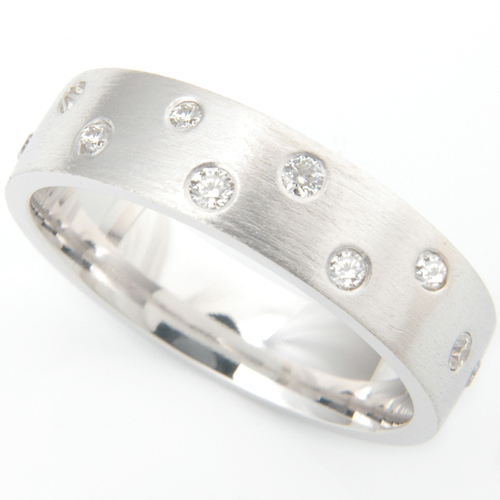 All the diamonds have been rub set into the 18ct white gold wedding band. The flat court profile of this wedding ring gives it a contemporary style. It has a brushed finish to add that extra bit of detail and to show off the scattering of sparkling diamonds.